The Thali cafés have been blazing a sustainable trail in Bristol for years with their original restaurant in Easton soon being joined by sibling ventures in Montpelier, Clifton and Totterdown. Their newest inclusion serves lucky Southville – a place quickly becoming the place for hip young families seeking good living without skimping on the delis, bistros and pubs run by the tattoos-and-vintage-hair-dos crowd more readily available north of the river. They’ve landed next to the Tobacco Factory in a huge, warehouse-like space, but the food and the service are just as good as in their more intimate venues. Breakfast is a recent addition, but shouldn’t be missed – you can opt for a traditional aloo paratha or a more familiar full English, though the latter brings an Indian flavour in gunpowder potatoes, coriander infused sausage and homemade tomato chutney; all meals come with hot, milky chai which transported me back to my days of traversing Kerala by train (all that’s missing is the wallah). 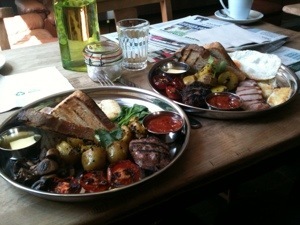 They’re generous with the portions and happy to add extras, so the Egg Poacher’s carnivorous breakfast came with the King of All Breakfast Additions – lightly toasted halloumi – as well as all the regulars you might hope for (excellent crusty toast, fried tomatoes and great, thick rashers of bacon). They are resolutely friendly, and all are welcome – children can (and will) run free and have their own portions while those looking to start the weekend properly can opt for a pint of Kingfisher, straight from the tap. Price: from £1.50 (Chai & toast) to £7.25 (Thali festival fry up).